Four-valve cylinder heads with overhead camshafts and dual spark plugs increase combustion eﬃciency to help ensure seamless throttle response, gutsy low- to mid-range output, better fuel eﬃciency, and reduced emissions. To further reduce mechanical sounds, each cylinder head’s cam cover is separated from the cam bearing caps, and a rubber gasket is used between the cylinder head and the cam cover. The Suzuki Clutch Assist System (SCAS) reduces the force needed to pull in the clutch lever, so clutch operation remains light. The clutch features back torque limiting clutch system, contributing to smooth downshift operation. New Metallic Gleam Gray or Glass Sparkle Black colors and complementary graphics combine with the Blacked Out Special Suzuki (B.O.S.S.) 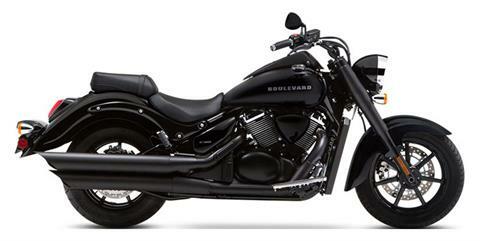 styling to create a visually stunning cruiser that lives up to its looks by delivering a great ride. 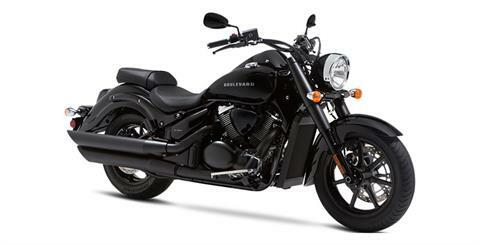 Ninety cubic inch (1462cc), 54-degree, V-twin engine rumbles through dual pipes as it smoothly puts down power that’s at home in town or out on the highway. Riders settle in behind wide, buckhorn-style handlebars, with feet comfortably on forward-mount floorboards, while sitting on a plush seat that’s just 28.3 inches above the ground.